Grand Rapids Symphony musicians are everywhere. 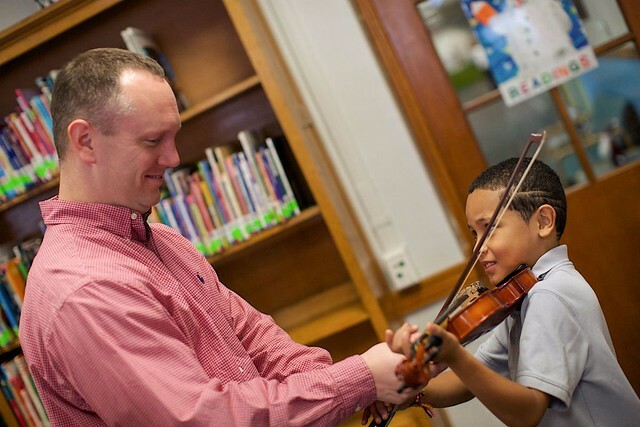 Not only on stage, but in classrooms, health care communities and unexpected places across West Michigan, sharing music that warms the heart, stirs the soul, and changes lives for the better. In fact, the Grand Rapids Symphony reaches nearly 90,000 people through music education and community outreach each year. With your help, we can reach even more. And thanks to the Wege Foundation, if you give a little, the Grand Rapids Symphony will get even more. Celebrate “Giving Tuesday” on Nov. 29 by making a donation to the Grand Rapids Symphony’s Annual Fund, and the Wege Foundation will match your gift dollar for dollar. In fact, donate any time before Jan. 31, 2017, and the Wege Foundation will match your donation. If you give $50, we get $100. Call the GRS Development Team at (616) 454-9451 ext. 123 to donate by phone. Or make a secure donation online. Your donation also supports Gateway to Music, a matrix of 16 educational opportunities to become part of the Grand Rapids Symphony family. Two of them include our Artists in Residence program, which sends musicians into area schools to share the gift of music; and our Fifth Grade Concerts, which brings students to DeVos Performance Hall to hear the Grand Rapids Symphony do what it does best. Seven years ago, Remington McKinnon was a student at Sand Lake Elementary when she got to conduct the Grand Rapids Symphony at a Fifth Grade Concert. Your donation also makes possible Access to Music, a free concert for music lovers who can’t necessarily afford to attend a concert or who may not be physically able to come to DeVos Performance Hall. Make your gift on #GivingTuesday or any day. It’s never too late.